by Chris Woodford. Last updated: March 24, 2019. Photo: Pollution means adding substances to the environment that don't belong there—like the air pollution from this smokestack. Pollution is not always as obvious as this, however. Most water pollution doesn't begin in the water itself. Take the oceans: around 80 percent of ocean pollution enters our seas from the land. Virtually any human activity can have an effect on the quality of our water environment. When farmers fertilize the fields, the chemicals they use are gradually washed by rain into the groundwater or surface waters nearby. Sometimes the causes of water pollution are quite surprising. Chemicals released by smokestacks (chimneys) can enter the atmosphere and then fall back to earth as rain, entering seas, rivers, and lakes and causing water pollution. That's called atmospheric deposition. 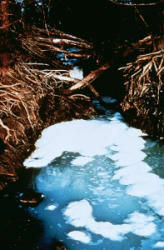 Water pollution has many different causes and this is one of the reasons why it is such a difficult problem to solve. With billions of people on the planet, disposing of sewage waste is a major problem. According to 2015 figures from the World Health Organization (the most recent available at the time this article was updated in 2019), some 2.1 billion people (28 percent of the world's population) don't have access to safe drinking water, while 2.3 billion (30 percent of the world's population) don't have proper sanitation (hygienic toilet facilities); although there have been great improvements in securing access to clean water, relatively little progress has been made on improving global sanitation in the last decade. Sewage disposal affects people's immediate environments and leads to water-related illnesses such as diarrhea that kills 525,000 children under five each year. (Back in 2002, the World Health Organization estimated that water-related diseases could kill as many as 135 million people by 2020; in 2016, the WHO was still estimating the annual death toll from poor water and sanitation at close to a million people a year.) In developed countries, most people have flush toilets that take sewage waste quickly and hygienically away from their homes. Yet the problem of sewage disposal does not end there. When you flush the toilet, the waste has to go somewhere and, even after it leaves the sewage treatment works, there is still waste to dispose of. Sometimes sewage waste is pumped untreated into the sea. Until the early 1990s, around 5 million tons of sewage was dumped by barge from New York City each year. According to 2002 figures from the UK government's Department for the Environment, Food, and Rural Affairs (DEFRA), the sewers of Britain collect around 11 billion liters of waste water every day; there are still 31,000 sewage overflow pipes through which, in certain circumstances, raw sewage is pumped untreated into the sea. The New River that crosses the border from Mexico into California once carried with it 20–25 million gallons (76–95 million liters) of raw sewage each day; a new waste water plant on the US-Mexico border, completed in 2007, substantially solved that problem. Unfortunately, even in some of the richest nations, the practice of dumping sewage into the sea continues. In early 2012, it was reported that the tiny island of Guernsey (between Britain and France) has decided to continue dumping 16,000 tons of raw sewage into the sea each day. Detergents are relatively mild substances. At the opposite end of the spectrum are highly toxic chemicals such as polychlorinated biphenyls (PCBs). They were once widely used to manufacture electronic circuit boards, but their harmful effects have now been recognized and their use is highly restricted in many countries. Nevertheless, an estimated half million tons of PCBs were discharged into the environment during the 20th century. In a classic example of transboundary pollution, traces of PCBs have even been found in birds and fish in the Arctic. They were carried there through the oceans, thousands of miles from where they originally entered the environment. Although PCBs are widely banned, their effects will be felt for many decades because they last a long time in the environment without breaking down. Pollution: Causes, Effects, and Control by Roy Harrison (editor). Royal Society of Chemistry, 2001. Comprehensive (579-page) introduction to all forms of pollution. An Introduction to Pollution Science by Roy Harrison (editor). Royal Society of Chemistry, 2006. Another good introductory text covering all types of pollution. Biology of Freshwater Pollution by Christopher Mason. Prentice Hall, 2001. This book is aimed at advanced undergraduates and water pollution professionals. 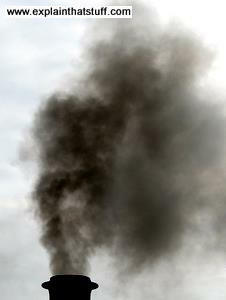 Managing Environmental Pollution by Andrew Farmer. Routledge, 1997. More emphasis on "pollution solutions" in this book. Pollution (Ecographics) by Izzi Howell. Franklin Watts, 2019. An illustrated introduction to air and water pollution for ages 9–11. Trash Vortex: How Plastic Pollution Is Choking the World's Oceans by Danielle Smith-Lera. Compass Point/Capstone, 2018. A 64-page introduction to the Great Pacific Garbage Patch and the issues it raises. Earth Matters by Lynn Dicks et al. Dorling Kindersley, 2008: A more general guide to problems Earth faces, with each major biome explored separately. In case you're interested, I contributed the polar regions chapter. The book is mostly a simple read and probably suitable for 7–10 (and maybe 9–12). In China, the water you drink is as dangerous as the air you breathe by Deng Tingting, The Guardian, 2 June 2017. Half the country fails to meet its water quality targets. 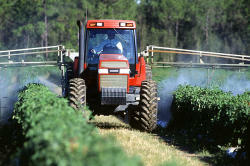 Water Pollution and the Farm Economy by Justin Gillis. The New York Times, December 11, 2012. In the United States, progress in farm output carries a cost in polluted rivers and streams. ↑ For a summary, see "Agricultural Chemicals in Iowa's Ground Water, 1982–95." by Dana Koplin. US Geological Survey, 1997. More recent studies have found glyphosate (sold under brand names such as Roundup®) in groundwater samples in Spain, Canada, Mexico, and elsewhere. For a review of the complex debate over glyphosate safety, see (for example) Vandenberg et al (2017), and Tarazona et al (2017). ↑ World Health Organization (WHO): Diarrhoeal disease, Fact sheet Number 330, May 2017. ↑ Estimates in different publications quote 4–5 million tons. See "Our World." New York Magazine, April 16, 1990, p.28. ↑ Sewage Treatment in the UK: UK Implementation of the EC Urban Waste Water Treatment Directive. Report by DEFRA, London, 2002, p.1. The figure of 31,000 pipes comes from Surfers Against Sewage. ↑ "Wastewater Treatment Cleans Up Border Waterways" in U.S.–Mexico Border. US Environmental Protection Agency (undated). ↑ It's very hard to find a decent estimate for the world's total annual production of industrial waste—partly because the term isn't precisely defined and partly because no-one has any obligation to measure. In 2000, the AAAS Atlas of Population & Environment suggested a figure of 1.5 billion tons was being produced by the entire OECD during the mid 1990s. In 1998, James Spalding et al told the Academy of Marketing Science (AMS) annual conference that the US produced around 2.5 billion tons of industrial waste per year and estimated that to be "perhaps a third of the world's refuse," giving a grand worldwide total of 7.5 billion tons. From these and other similar estimates, it seems 5–10 billion tons might be a reasonable ballpark figure. ↑ Around 1.5 million tons were produced worldwide according to 12. Polychlorinated Biphenyls (PCBs): Uses and Environmental Releases by Dr Heidi Fisher (archived via the Wayback Machine). A 1982 estimate suggested about four percent of this total has been destroyed, two thirds of the remainder has been stored or is still in use, and a third has been discharged into the environment. See "Polychlorinated biphenyl (PCB) contaminated sites worldwide" by Ivan Holoubek in PCBs: Recent Advances in Environmental Toxicology and Health Effects by Larry W. Robertson et al (eds), University Press of Kentucky, 2015. Other chapters in this book cover PCB transport into remote parts of the world. ↑ Bitter Sea: The Human Cost of Minamata Disease by Akio Mishima. Kosei Pub, 1982. ↑ See for example "Norway fury at UK nuclear waste flood." by Paul Brown, The Guardian, December 20, 1997. A recent (2017) study found that a major accident at Sellafield could pollute a significant proportion of Norway in as little as 12 hours. See Worst Case Meteorological Scenario for Norway in Case of an Accident in Sellafield Nuclear Siteby Heiko Klein and Jerzy Bartnicki. ↑ International Maritime Organization: Marine Environmental Awareness, 2011 Edition, IMO Press, 2011 reveals that routine shipping adds three times as much oil to the marine environment as accidental pollution (but that doesn't factor in significant discharges coming from the land). 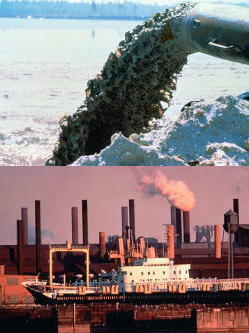 According to Pollution Impacts on Marine Biotic Communities by Michael J. Kennish, CRC Press, 2007, about 58 percent of oil added to the oceans comes from land runoff, atmospheric deposition, and ocean dumping; 24 percent comes from all kinds of "marine transportation activities" (including routine shipping operations and tanker spills); 8 percent comes from oil wells and refineries; and natural inputs add 10 percent. 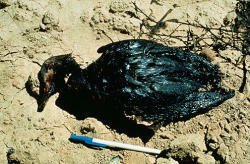 ↑ There have been many estimates of the impact of the Exxon Valdez spill. They differ wildly, largely because the spill was studied at different times, by different groups with different scientific, political, and financial agendas. My upper figures are taken from Exxon Valdez: Ten Years On, BBC News, March 18, 1999. One definitive academic study worth seeking out is Exxon Valdez Oil Spill: Fate and Effects in Alaskan Waters, ASTM International, 1995, which collected 25 papers from an ASTM symposium in April 1993. ↑ The impact on seabirds of marine debris is explored in The American Bird Conservancy Guide to Bird Conservation by Daniel J. Lebbin et al. University of Chicago Press, 2010, p.340. The shearwater study is quoted in Biological Oceanography: An Introduction by Carol Lalli et al. Elsevier, 1993. p.253. Tim Benton's studies of the Pitcairn Islands are thoroughly documented in The Pitcairn Islands: Biogeography, Ecology and Prehistory: Proceedings of an International Discussion Meeting Held at the Linnean Society by T.G. Benton et al, Linnean Society of London, 1995. ↑ [PDF] Clean Watersheds Needs Survey 2012 Report to Congress, Environmental Protection Agency, January 2016. ↑ The figure of 80 percent is widely quoted in books on pollution. For example, here's a sample from Google Books. ↑ The figure of 8 million tons comes from a research study by Kara Lavender Law et al. See Plastic waste inputs from land into the ocean, Science 13 Feb 2015. There's a more accessible account in Eight Million Tons of Plastic Dumped in Ocean Every Year by Lara Parker, National Geographic, 13 February 2015. 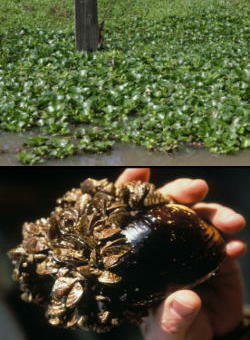 ↑ [PDF] Invasive Alien Species: A European Response, European Union, 2014.